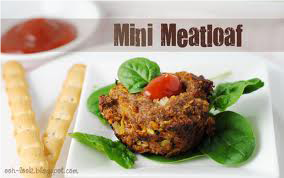 In small bowl, combine all ingredients and form into a small meatloaf. Place in glass dish, cover, and bake 25-30 minutes. Uncover dish, add barbeque sauce or homemade sugar free tomato sauce to top, and bake 5-10 additional minutes. Serve immediately with a bit more of barbeque or tomato sauce for dipping. This includes your meat, grissini, and ½ teaspoon of your daily allowance of milk.